Pascale Beaudin (Clori), Philippe Gagné (Lidio), Dominique Côté (Eurillo). If it is true that fame is a matter of having the necessary talent and being in the right place at the right time, then perhaps the reverse is also true – one can have the talent but be in the wrong place at the wrong time. Something of the sort seems to have happened to Paolo Lorenzani. Born in Rome, Lorenzani’s early musical career appeared to mark him out for fame. While a choir boy in the Cappella Giulia within the Vatican, he studied composition with the highly regarded Orazio Benevoli. As a young man his sacred music, performed in several Roman churches, was well-received. In 1675 he was appointed Maestro di cappella at the Jesuit church of the Gesù, and its associated seminary, the Collegio Romano. He seemed to be establishing himself as a significant figure in the world of Roman music and his prospects must have looked good. Yet he chose, before 1675 was out, to leave Rome for Sicily, becoming Maestro di cappella at the Cathedral in Messina. While there he attracted the patronage of the Duke of Vivonne, Viceroy of Sicily and Marshall of France, writing divertissements, ballets and the like for some of Vivonne’s festivals. In 1678, however, the Duke and his armies were recalled to Paris; Lorenzani, presumably not wishing to lose his patron, chose to sail to France with them. One wonders whether or not, as he left Sicily, Lorenzani had any idea of what a complex musico-political world he was about to enter. The ongoing ‘war’ between those (led, ironically, by Lully, born in Florence but a naturalized French citizen) who sought to develop and maintain a national ‘French’ style of music and, on the other hand, those (led by, amongst others, Cardinal Mazarin – another born in Italy who had become a French citizen) wanted to encourage Italian music and musicians, was to prove a difficult environment for Lorenzani. Things started off well for Lorenzani; introduced to court by Vivonne, the king heard a motet by Lorenzani and liked it so much that he arranged for several further performances. He also provided most of the money which allowed Lorenzani to purchase, with royal approval, the position of maître de musique de la Reine. But, increasingly Lorenzani found himself obstructed by Lully. Lully thwarted Lorenzani’s chances of an appointment as sous-maître de musique de la Chapelle. He also endeavoured to prevent a production of Lorenzani’s short pastoral opera, Nicandro e Fileno; but he was unable to do so, and it received several performances at Fontainebleau in September 1681, where a small theatre was specially constructed in the Galerie des cerfs. These performances seem to have been largely well-received by their audiences. In some ways the performances had a significance beyond the merits of the work itself, as Manfred Bukofzer (Music in the Baroque Era, 1948) notes: “The performance … of the Italian pastoral Nicandro e Fileno … constituted the last, though futile, attempt to upset the French opera, by now firmly entrenched at court”. While Nicandro e Fileno is no lost masterpiece it deserves a better fate than it has had hitherto. After the initial performances it effectively disappeared, until a manuscript was found, in the Biliothèque National, by the French scholar Henry Prunières in 1922. This manuscript has neither title-page nor overture and there is no way of knowing whether an original overture has been lost, or whether none was ever written. A full study of the manuscript had to wait for the attentions of the Canadian musicologist Albert La France (author of the entry on Lorenzani in The New Grove). La France prepared a critical edition which was used for a staging in Montreal in 2017, by the forces heard on this CD – which is the work’s world première recording. I find it amusing that the problem presented by the absence of an overture should have been ‘solved’ by using music by, of all people, Lorenzani’s ‘enemy’ Lully, taken from Act III of his Amadis. Perhaps the choice can be viewed as kind of revenge, since after all of Lully’s opposition to Lorenzani and his music, Lully’s own music has been put to the service of Lorenzani’s rediscovered opera. The opera, in three short acts, has an archetypal comic plot, in a pastoral setting. Two old men, Nicandro (sung by tenor Nils Brown) and Fileno (the baritone Jean-Marc Salzmann) agree that each should marry the other’s daughter, so as to have the comforts of a young wife in their old age. 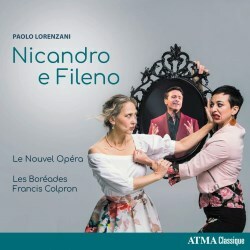 The two girls, Filli and Clori (sung by sopranos Suzie LeBlanc and Pascale Beaudin), who have no wish to marry the old men, are initially rivals – since both of them fancy Lidio (Philippe Gagné) who turn and turn around professes love for both girls! After some fairly predictable complications, a resolution is reached; as in all good comedies, from Plautus and Terence to P.G. Wodehouse, the old are ‘defeated’ by the young. Nicandro and Fileno recognize the foolishness of their original scheme, and the girls are married to more suitable husbands. Unsurprisingly, this is not an opera which undertakes the study or expression of powerful emotions – the libretto, incidentally, is by one Philippe-Julien Mancini, nephew of Mazarin and a relative of the Duke of Vivonne (Lorenzani’s patron was still proving useful). But if the work lacks emotional weight, it has plenty of elegance and charm and some well contrived situations. All six members of the cast, especially LeBlanc and Beaudin, acquit themselves well. Brown and Salzmann characterize the initial stupidity of Nicandro and Fileno with an engaging effectiveness. LeBlanc is striking in her articulation of her love-pains in the second scene of Act I and finds the right scale of unforced dignity for her prayer to Love ‘Guidami pure Amor’ (Lorenzani’s instrumental writing is particularly fine here, too. The playing of Les Boréades de Montréal is impressive throughout, full of unexaggerated vitality and well-judged rhyhthms (the band is 12 strong, including 2 violins, 2 viole da gamba, 2 recorders, 1 theorbo/guitar, 1 harpsichord and some limited percussion). Atma generously provide the full Italian libretto, alongside English and French translations. Although without a position at court after 1683, Lorenzani initially chose to stay in Paris, becoming director of music at the Theatine Convent there, where his compositions attracted some favourable attention. His Te Deum and some of his motets were performed in other Parisian churches. Gradually, however, he grew weary of Parisian musical life, according to his contemporary the musical connoisseur and chronicler Sébastien de Brossard. Fortunately, an escape offered itself. He was invited by the chapter of the Cappella Giulia (where he had originally been a choirboy) to become Maestro di cappella. This must have seemed like a rather special kind of homecoming, when he left for Rome in the spring of 1695. Once again, he was active – and appreciated – in the musical life of his birthplace. Sadly, however, most of the works he wrote after his return seem to have been lost.